Can You Complete My Puzzle? This entry was posted in Gallery and tagged 365, 365 Project, d7000, fact, fun, games, hart, History, jigsaw puzzle, night, Nikon, Photo, Photography, put it together, puzzle. Bookmark the permalink. Sometimes it’s just so much more fun fitting the puzzle together with someone else, instead of alone….. This reminds me of one of my favourite pieces or art I made years ago. I bought a cheap round jig saw, completed it then turned it over. I then took it apart a piece at a time and painted each piece with poster paints. Then once dried I turned it over and placed it on a clip frame backing, taking out a few pieces at random and then completed the framing so those few just laid near the otherwise completed jig saw! 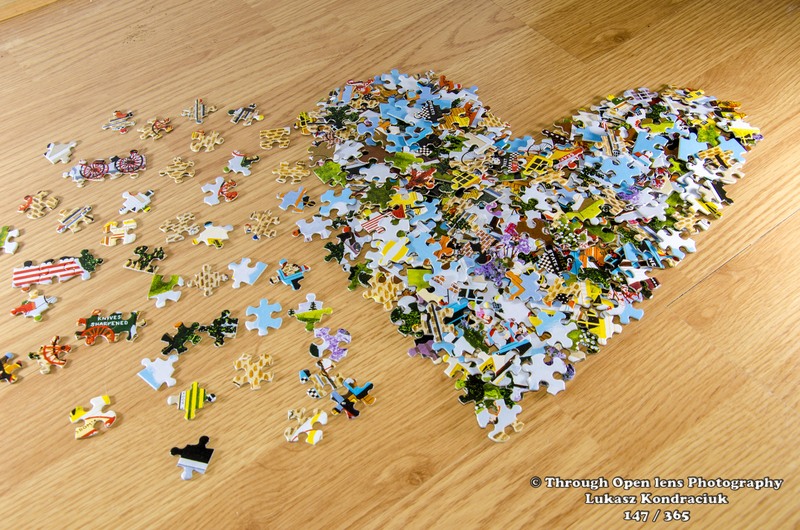 Nothing more eye catching than an incomplete jigsaw when you can see the way to complete it.